Thang #2: The Nemesis/Partner Flap-Jack: For this exercise, PAX were led to the top of the Hill and told to pair off and share with their partner what was their “nemesis” exercise (that thing they would really rather not do). Then, PAX#1 got to do that exercise for for PAX#2, while PAX#2 bear crawled down the hill and Bernie Sanders’d back up. Flapjack, so that PAX#1 did bear-down/bern-up while PAX#2 did PAX#1’s nemesis exercise. And just to make sure no one felt like they got off too easy, we did another Flapjack, this time, giving each PAX a chance to face their own nemesis exercise for the length of their partner’s turn on the hill. Prayers for the brothers — Lifting up the Naperville convergence on April 27th, prayers for Holy Week, that the Body in our individual places of worship would feel the closeness and connection to the Lord that sustains and strengthens our worship and mission. — Gratitude for bodies that can be worked and the opportunity to use them well. — Thanks for FNG–Stretch being added to the number. Respect Respect! A glorious red-orange dawn, and a persistent mist around the AO made for an awesome ruck-day full of good sights. Not a soul to be seen or heard except for birds. Glad to be up and after it outside in the early hours. The Gloom really is the best part of the day. Maybe that’s just the ruck talking… After a good arm-beatdown by Archive this Saturday, this Q realized he needed to put his noodle-arms through more than the typical workout. So he went with Archive’s unofficial motto: when in doubt, add weight. Prayers for the brothers — Prayers for strength, grit, and faith this week. Courage for any solo-Qs and a feeling of community to pervade those moments. Prayers for those traveling that they Post where they are. With an uncomfortably warm (44 degree!) day, three dazed and confused PAX rallied around the shovel-flag at AO Mastodon for another Thursday. None of us know how to dress for 40+ weather, and the threat of showers only made it worse. Banks confused us all by bringing a jacket that altered his usual shape, color and sound! I guess our habits are getting too predictable. The Q was so thrown that he decided to go a little bit “extra” on a number of exercises. Prayers for the brothers — Motivation. Motivation. Motivation. — Prayers that we would be encouraged and filled up so that we could in turn be a blessing to those around us. — Gratitude for bodies that are made for work. After Banks’ helpful surprise at my failing to ruck for the last 10 reps of the Merkin’ Mile last Monday, this week saw a repeat routine but a “no excuses” attitude. After the 5 Alive ruck challenge and the “both-feet in” attitude of Jazz Hands (formerly FNG) on Saturday, this felt like a modest hill to climb on a Monday morning. Prayers for the brothers — Prayers for protection and the gentle (but definite) nudge into action for all those brothers past, present, and future who might take the plunge and join our crazy crew. Prayers for myself to hear and answer the call on my own life to step up and stand for the people and things that matter. Monday morning came faster than desired, and saw our Q rolling out of bed with more grumble than usual. What better to do than #EmbraceTheSuck. With the mini-convergence and a weekend of home-maintenance in the rear-view, it was time for a good double-down. Prayers for the brothers — Prayers for the AO, for mankind in general (and men in particular), that we would hear the call to righteousness and respond, that we would heal creation instead of hurt it, lifting up one another into life as it is meant to be. That the men of our group and those we can EH to join us would be strong, courageous, humble and loving in that mission. That our lives and those we touch would be strengthened and equipped to do good works in the world. 3.21.19 – When in doubt, Moar Leg Day! With the comfortably cool weather lingering for another week, two PAX headed over to AO Mastodon to see what Thursday had in store. The Q’s legs were mostly back in working order after Banks’ Ultimate Leg Day on Saturday, so he figured it was better to show them who’s boss than to give them a break. Pleasantly surprised that what followed was not terrible. Burpees were probably the low point. Prayers for the brothers — finish the week strong, be faithful servant leaders at work, at home and in our community. Prayers for the brothers — growth, focused on the right people for our group — that those who come would find what they are looking for in each F in their lives — encouragement in the walk. At this point, I don’t think I could fully feel my legs. This portion was definitely a wind-down by comparison. I think our 1/4 mile time was about half the pace of our original mile. Bumped in to Avon at the end, who posted for coffee despite a back-injury. Mosey to the flag for a wrap-up. Prayers — prayers for personal discipline and courage for the week ahead, for wisdom in prioritizing and encouragement for PAX and their families to make it through the month. It’s two days later, and I’m still getting out of my chair like an old man. Good times. Thought of the Day: Maybe Banks will get the 45min week-day slots from here on out. I’m in danger of getting in shape. 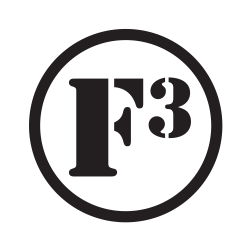 TODO: figure out permissions for f3wheaton; also, stretch more. After being warned in an evening text that he was likely on his own, the Q was not going to let the novelty of a 50 degree morning in March go to waste. Arriving across the soggy trails at the AO, he saved his Leg Day plans for another time. No one wants to belly-ache through Dan Taylors alone when they can be shared. No puddle left behind on the two circuits of the park. Found some new hazard zones. Prayers for the brothers — health, stamina and encouragement in the walk. Prayers for those who will consider joining this crazy group this year. After avoiding the winter blast of the previous week, our Q was out of excuses on a balmy 24 degree day. With the time change only a day previous, he greeted the return of the gloom. Not even the birds were stirring yet, and only one other elusive runner was briefly spotted in the AO. To double-down on that Monday feeling, he threw in some of everyone’s favorites for a ruck to remember. Prayers for the brothers — growth, finding and calling the right men who need to be here and serving them — Helping them to serve others.